I first heard about the lab when I was in middle school and immediately wanted to visit. I held off on applying until after I graduated and gained some field experience in South Africa through Oceans Research. 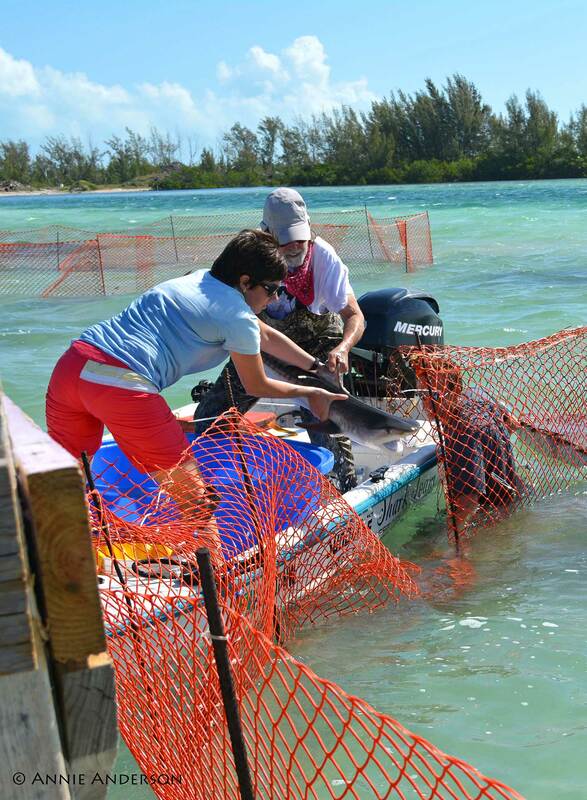 I volunteered at the Bimini Biological Field Station from January to May of 2013. I was only supposed to stay until March but Jill Brooks kept encouraging me to extend my stay and I couldn’t resist. I was working up in Alaska, assigned to a boat in the middle of the Bering Sea when Jill asked me to send my resume because I was being considered for the Assistant Manager position. When I heard back that I was going back to Bimini I was thrilled. My crew aboard te vessel I was assigned to at the time baked me a “Congratulation Rachael” cake, it was very sweet. I was Jill’s assistant until this past July, 2014 when I took over as Manager. I deal mostly with the volunteer selection process, food prep and organization, and balancing the upkeep of the station with the science. Ultimately I send out the acceptance emails and coordinate with new volunteers arriving, and payments. I also balance the books here in Bimini and coordinate with university courses. I have a slightly embarrassing story from when I was still an Assistant Manager. 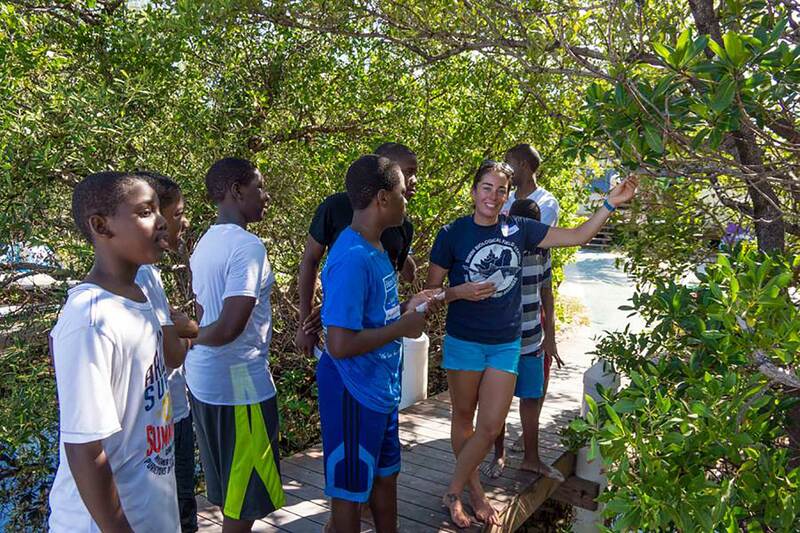 We had a university course visiting the lab, which is always a little more stressful because we only have a week to show the students all the great features of Bimini and hopefully lots of sharks. In our morning meeting to plan the day, my fellow Assistant Manager, David Flannagan and I volunteered to bait for black tips for the course. In addition to baiting for black tips that day we had to swap out 4 of our acoustic receivers along the North Eastern side of Bimini and lay down some sand bags to try and make the path into Aya’s Spot shallower to allow others to walk down the channel without getting wet up to the neck. We had a lot to plan and pack for the day, around 3 dry boxes, bait, free diving gear, receiver gear, and buckets and bags to put sand in. In all the rush of the morning we forgot the bait box for the black tips on the dock and did not realize our error until we were anchored at the place where we bait for them, a 45 minute choppy, uncomfortable boat ride away. We wanted to fix the problem without letting Doc know so we radioed the lab and tried to tell one of the other staff members to bring his boat out early before Doc and the other students came out and to bring the bait with him. Of course Doc found out he left early and I could hear my fellow staff member trying to cover for me and make up an excuse for leaving early (blaming it on the rough weather) so I radioed Doc and told him we had forgotten the bait. He was not happy but allowed the other staff member to bring the bait out to us and we began baiting. Within 30 minutes we had 3 blacktips circling behind our boat. We had the gear to catch them but were waiting for the other students to arrive with Doc in the Twin Vee. Shortly after Doc arrived and had a student on his boat dropped their anchor right on top of our own. David and I could see the Twin Vee drifting closer and closer to our little 16’ skiff, in the choppy water. We had let out all of our anchor line and could not drift back any further. As the Twin Vee’s engines began to loom above our bow and I had to catch the props to keep them from hitting our boat we released our anchor line and David jumped out of the boat to recover the anchor and line so we could reset it further from the Twin Vee. Doc yelled at us for letting the line go and said it was completely unnecessary, which was frustrating but there is no point arguing in front of the course. Once we re-anchored we began re-baiting because the black tips had been scared away by all the action. It immediately became apparent that we not only had brought not enough bait, but the wrong kind of bait (we used a large snapper, that would have been edible but we were short on bait at the station), and it was not cut up as Doc preferred (little bite size pieces, pre-cut). Doc wanted us to cut the bait into little pieces and throw it in front of the shark as it turn toward the boat to train them into taking it so they would take the hook. Simply enough but if we waited for Doc to say when to throw, by the time we tossed the bait it would be too late, so David or I would stand at the back of the boat poised and ready to throw the bait when the shark turned towards the boat but Doc wanted to make sure we didn’t throw it early so he kept yelling “NO!” every 4 seconds if the shark wasn’t in position. So for 2 hours I stood waiting to throw bait in front of the black tips that thankfully showed up again, having Doc yell “NO!” at me over and over. At one point I couldn’t resist myself and pretended to get ready to throw the bait when I knew the shark was not in the right position and Doc screamed “NOOOOO!” It was a kind of ridiculous and stressful situation in which you have to find the humor. We could easily have gotten the black tips to take the baited hook if we were calm and patient but there was pressure to impress Doc and the students and we were worried about running out of bait before catching a shark. I was so anxious to catch a black tip for the course at one point while rushing to get more bait to toss I slipped on some blood and fish scales on the floor of the boat and landed hard on my hip in front of all the students. I had never wished to catch a shark so much in my life. In the end one gorgeous black tip took our baited hook and we were able to do a work up of the shark as doc held it in tonic. The students all had a great time and I was repeatedly reassured by the students for the next few days that we had done a great job and they really enjoyed the experience. In the evening meeting Doc said that there were a lot of things that didn’t go well but he couldn’t complain too much because in the end it was a success. This past year, I celebrated my birthday in the best way yet. 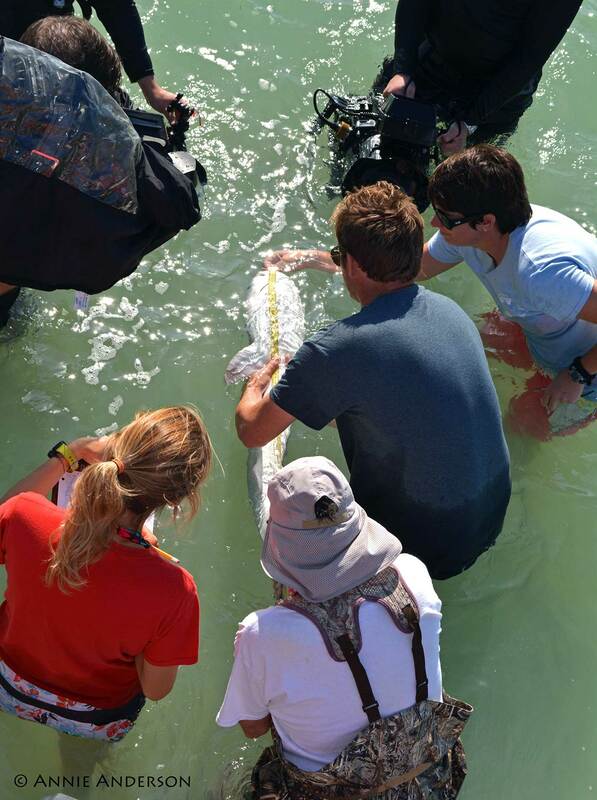 We spent the entire day searching for an adult lemon shark to catch and hopefully insert a 7-year transmitter inside. We saw a few neonate sharks in the shallows but we didn’t see any adult sharks until around 3pm. 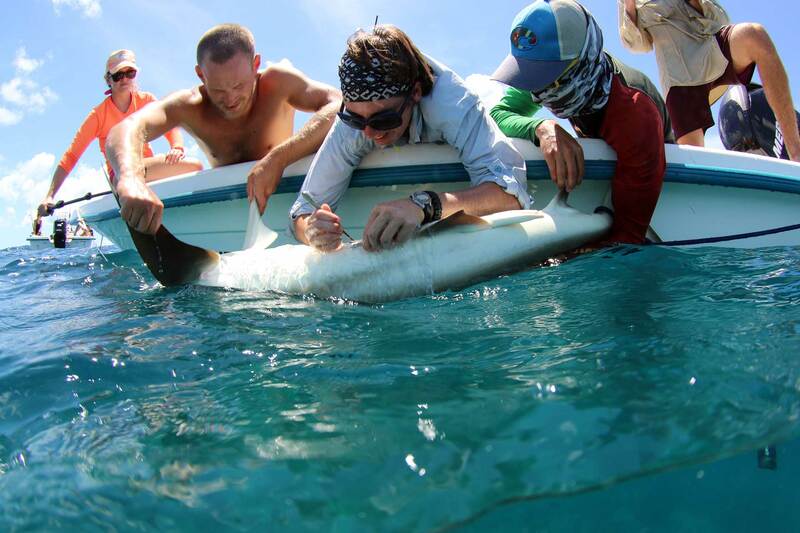 We finally managed to catch one I got to perform my second ever shark surgery and place the tag inside a 254cm female lemon shark. 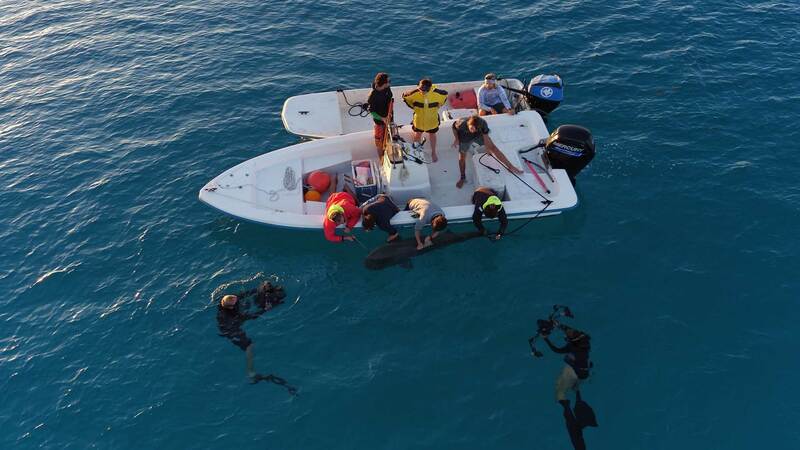 Typically after we work up an adult lemon shark, when it is shallow enough to stand we typically have an experienced member of our team walk the shark a few feet away from the boat until the swim off strong. It’s exhilarating and a little scary to hold an 8/9ft shark in your arms knowing they are flexible enough to bite their own tail. 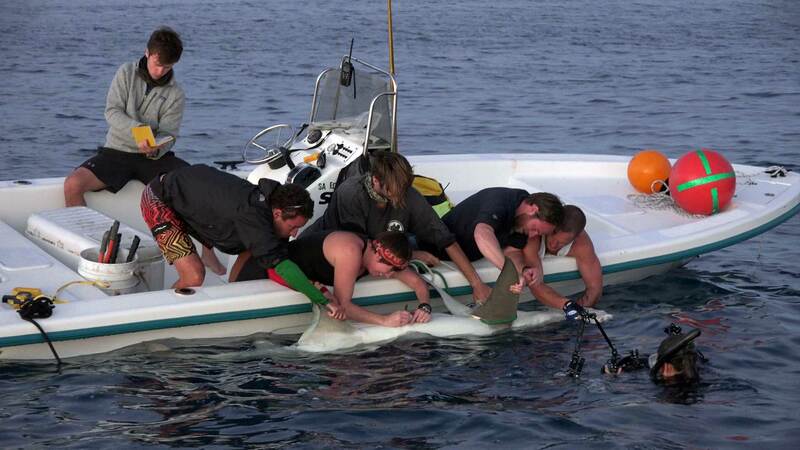 I had never done it before but despite getting the honor of placing the transmitter the crew out with me that day let me walk the shark as a birthday gift. It will be a tough present to beat in future years. This past year we began a bit of a prank war here at the lab. I’m not sure I can say began because the Shark Lab has a tendency to attract wily and facetious young adults. 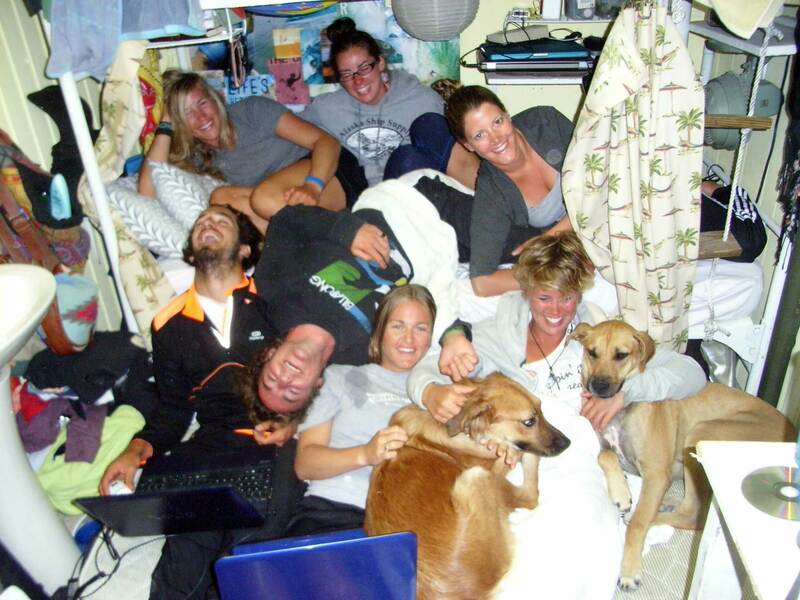 It takes an adventurous personality to abandon their home to live and work at a small facility surrounded by shark infested waters. Perhaps we just increased the frequency with which pranks took place. My proudest prank took place on our September long line. I had the 5 am check along with Rob Bullock. 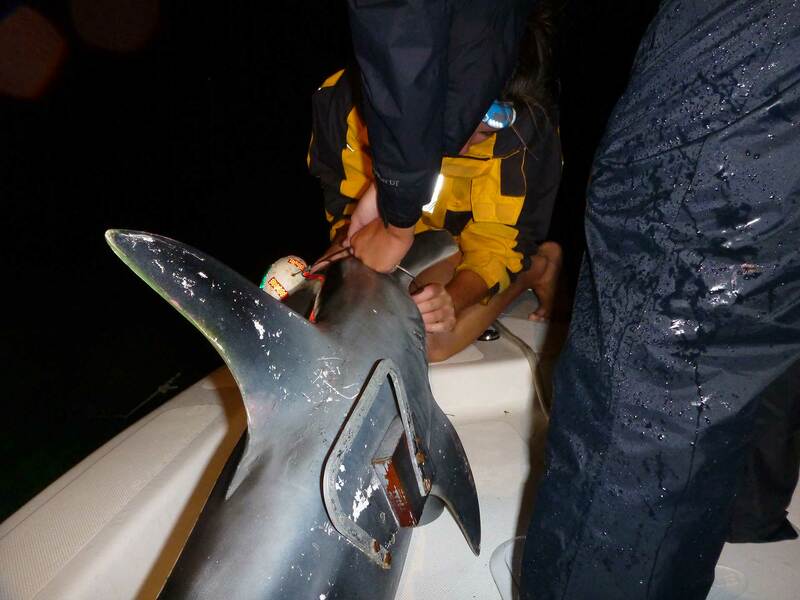 At 5 am we took our model hammerhead and attached it to the last hook on the last line. Unfortunately the Hammerhead floated. We figured it would still be pretty funny. As the 9 am check got ready to leave I had to contain my excitement. Around 9:45 we got a radio from the longline check crew of “Sharklab Sharklab Sharklab come back to Indy!! !” Unfortunately at that moment Doc walked into the room and said “Well that sounds quite urgent. See what they need.” I wasn’t sure how Doc would take pranks but I didn’t want to get caught in a lie so I told him what I did. He laughed a little bit and worried about the integrity of the model but when he tried to radio the boat back to ask them what it was they said it was nothing. I wasn’t sure if they didn’t want to tell Doc but when they got back to the lab they played it cool and said they hadn’t gotten anything at all on their check. Turned out they were trying to keep it a secret and had left the model out for the next check, which made me anxious that it would be stolen or drift off. Thankfully it was recovered no worse for ware. What had actually happened on the check was that they had come up to the sunken float and when they got close Annie started yelling excitedly that it was a hammerhead. Everyone rushed to the side of the boat, both hopeful and dreading that it might be dead when it started to come up stiff and unresponsive. Then they realized the glazed look and writing on the fins and body. Gotcha. Since I was in middle school I’ve been interested in sharks. I grew up in Pennsylvania, hours away from the shore or closest aquarium. 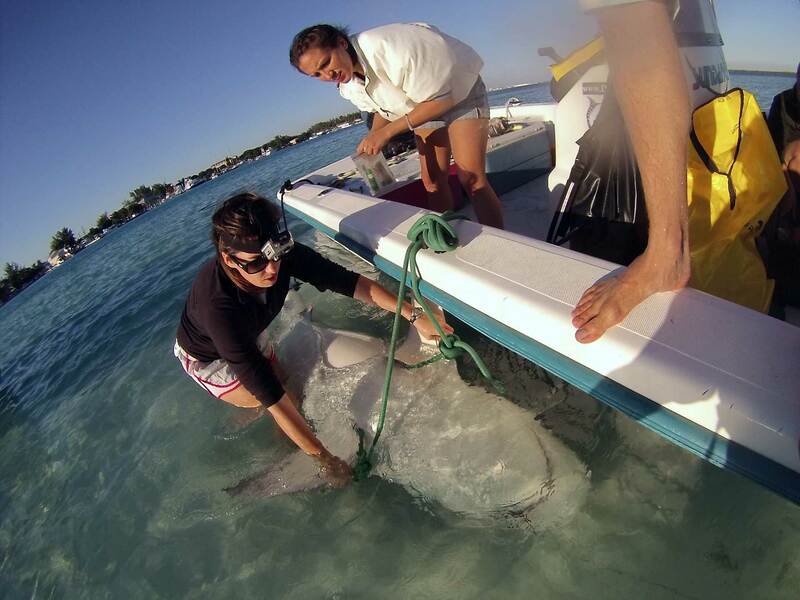 Being a marine biologist was a childhood dream along the same lines as being an astronaut or firefighter. Something all kids wanted to be but few grew up to be. Being accepted at the Shark Lab and participating in the research the lab undertakes helped me realize that I could be involved in this community and this life if I really tried. It is an obtainable goal if you work hard and want it bad enough.